UWaterloo Prof Natin Jathwani, Executive Director Waterloo Institute for Sustainable Energy: Big Wind guilty of wilful blindness on energy costs? Recently, energy analyst and occasional columnist for The Financial Post Parker Gallant wrote that the Canadian Wind Energy Association (CanWEA) was hitting back at allegations that wind power was contributing to Ontario’s rising electricity bills. Ontario representative Brandy Gianetta said wind power was a low-cost energy source, and she referred to University of Waterloo professor Jatin Nathwani for support. Trouble is, she was wrong. 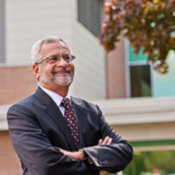 Professor Nathwani took the time to correct CanWEA’s statements in an email to Parker Gallant, published on his Energy Perspectives blog today. Her article points to two articles that purportedly support the “myth” she is “busting,” but both require closer examination. She cites Waterloo professor Natin Nathwani’s, (PhD in chemical engineering and a 2016 “Sunshine list” salary of $184,550) article of March 6, 2017, posted on the TVO website, which supports Premier Wynne’s dubious claims of “a massive investment, on the order of $50 billion, for the renewal of Ontario’s aging electricity infrastructure.” Professor Nathwani offers no breakdown of the investment which suggests he simply took Premier Wynne’s assertion from her “Fair Hydro Plan” statement as a fact! It would be easy to tear apart Professor Nathwani’s math calculations — for example, “The total electricity bill for Ontario consumers has increased at 3.2 per cent per year on average” — but anyone reading that blatant claim knows his math is flawed! First and foremost, the record needs to be corrected since Ms Giannetta’s assertions are simply incorrect and should not be allowed to stand. If she has better information on the $50 billion investment provided in the Ministry of Energy’s Technical Briefing, she should make that available. Total Installed Capacity Added to the Ontario Grid from 2008-2014 was 12,731 MW of which Renewable Power Capacity was 6298MW at a cost of $18.2 Billion. For the complete investment pattern from 2005 to 2015, please see data available at the IESO Website. In sum, generation additions (plus removal of coal costs) are in the order of $35 billion and additional investments relate to transmission and distribution assets. I take strong exception to her last statement suggesting that the 3.2 percent per year (on average) increase in total electricity cost from 2006 to 2015 in real 2016$. The source for this information is a matter of public record and is available at the IESO website. As for the electricity bill that the consumer sees, there is a wide variation across Ontario and this is primarily related to Distribution. For example, the average bill for a for a typical 750kWh home Ontario comes is $130 per month. In Toronto it is $142, Waterloo at $130 and Cornwall at $106. On the high side is Hydro One networks is $182 and this is primarily related to cost of service for low density, rural areas. Your Table 2 Total Electricity Supply Cost is helpful and correctly highlights the cost differences of different generation supply. Only wilful blindness on Ms Giannetta’s part would suggest that wind and solar are coming in at a low cost.